We’re now in Week 6 of the NFL season. To help prepare, here’s my weekly look at the top starts and sits for fantasy football players in IDP leagues. The collective groan that could be heard across the country last week was from IDP owners of Jerry Hughes and Michael Bennett. Both defensive ends were deprived of a sack due to the hard-to-comprehend roughing the passer rule. Bennett was flagged for what appeared to be a clean takedown of Kirk Cousins while Hughes let go of Marcus Mariota as he thought the play would be whistled dead and he wouldn’t have to take Mariota to the ground risking a whistle. To quote Cris Carter (during his ESPN days), “C’mon man!” It’s tough enough to navigate the IDP landscape without officials denying players their just due. Let me climb down from my soap box and welcome Reshad Jones back to fantasy dominance. You know … the whole water-finding-its-level thing again. Let’s take a look at some Week 6 IDP start/sit options. Keep in mind that we will be without players from the Detroit Lions and New Orleans Saints as they are on their bye weeks. One last side note here. The Oakland Raiders and Seattle Seahawks game is being played in London with the Raiders considered the home team. After notching a sack in each of the first three games, Clark has gone the past two weeks without getting to the quarterback. Well, that’s not entirely true as Clark has been credited with seven quarterback hurries and two hits in the last two weeks, so the pressure has been there. Look for him to get back on track against an Oakland offense that has allowed 6.5 sacks along with 60 total tackles to defensive linemen in the last three games. Hopefully you’ve read Ross Miles’ Week 6 IDP waiver wire advice, as Weatherly was mentioned as a potential pickup. Let’s go one better and get him in our starting lineups. With Everson Griffen unlikely to return anytime soon, Weatherly is entrenched as the starter opposite Danielle Hunter for the Vikings. In the past three weeks, Weatherly has put up solid DL2 numbers with nine total tackles with two sacks and a forced fumble. Let’s not chase Johnson’s big Week 5 stat line that saw him return an interception for a touchdown. A closer look reveals that Johnson played just 22 snaps last week which was less than both Carl Lawson and Jordan Willis who each played 31. There are far better options that play a lot more snaps than the veteran Johnson. It was encouraging to see Flowers play 51 snaps last week in his second game back after returning from a concussion. Flowers did manage half a sack along with four total tackles but has a brutal Week 6 matchup. The Chiefs have been very stingy in handing out fantasy points to the defensive line position. In the last three weeks Kansas City has allowed just two sacks and zero big plays to a defensive lineman. Whitehead is the only three-down linebacker for the Raiders, having played 315 of 318 defensive snaps. Over his past two games he has put up 21 total tackles with 13 being of the solo variety. The Seahawks’ run-heavy offense is giving up an average of 23 tackles per game to linebackers and also offers up big play opportunities. Linebackers have amassed 8.5 sacks along and four forced and two recovered fumbles against Seattle. We liked Brown last week with Wesley Woodyard dealing with a shoulder injury that ultimately kept him out of Week 5. He responded with 10 total tackles and a sack while playing 66 snaps. Start Brown again this week even if Woodyard plays in a great matchup with the Ravens. Last week the trio of Christian Kirksey, Jamie Collins, and Joe Schobert combined for 33 total tackles, a sack, and a forced fumble against Baltimore. This may be a bit of a boom-or-bust selection, as Perryman has yet to post a big play but has posted solid tackle numbers. The Browns lead the league in rush attempts with 157 and will offer up plenty of tackle opportunities for Perryman. In fact, five linebackers have posted double-digit tackles against Cleveland through the first five games. Playing approximately 75% of the defensive sacks, Perryman should easily put up his second double-digit-tackle performance of the 2018 season. Not yet. Last week, I suggested sitting Burfict with a wait-and-see approach in mind. The modest seven total tackles on 34 defensive snaps Burfict put up made it the correct call. This week it’s purely a matchup-based call. In the last three weeks the Steelers are allowing just 17.3 total tackles per game to linebackers while not allowing a big play to the position. In the two meetings between the teams last season Burfict had a total of nine tackles. 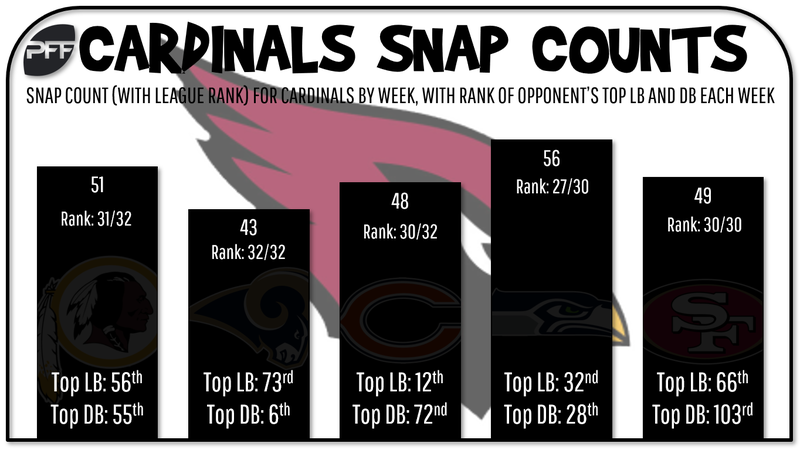 The Cardinals are a negative matchup for linebackers as the offense continues to struggle to stay on the field. Arizona is last in the league, averaging just under 50 offensive plays per game (49.4). In the first five games, a linebacker has not topped seven total tackles against the faltering Arizona offense. This is a situation where IDP owners can start a defensive back who is essentially playing a linebacker role for the Chargers. With Kyzir White out with a knee injury, the Chargers didn’t turn to a bigger role for Jatavis Brown; instead, they lined up Phillips in the box or on the defensive line on 30 of the 34 snaps he played. Over the past three games, the Browns have allowed a top-five fantasy point total to both linebackers and defensive backs. This is a win/win situation. It was good to see Tartt return from a shoulder injury in Week 5 and play 50 snaps. Unfortunately, the matchup with the barely-on-the-field Cardinals offense was never going to allow healthy fantasy production. Even better to see was that on 32 of the 50 snaps he played Tartt lined up in the box or on the defensive line. That will pay dividends this week against a Packers offense that gave up double-digit tackles to both Glover Quin and Quandre Diggs in Week 5. The outstanding play of the Bears defensive front as well as linebackers has severely limited Amos’ chances to make plays through four games. Amos has just 17 total tackles and has yet to register a big play. Things won’t get any better this week against a Dolphins offense that allows an average of just 18 tackles per game to defensive backs and has surrendered just two big plays in the past three games. Once again, I will bang the drum for IDP owners to not chase inflated stat lines. The veteran safety had a huge Week 5, but it was based on two interceptions. There is little chance Adams has a repeat performance — he had a total of two interceptions last season. Throw in the fact that Adams is averaging only five total tackles per game and we can safely look elsewhere for defensive back production in Week 6. I feel like I’m beating a dead horse, but the Cardinals offense isn’t on the field enough to offer up much fantasy production from defensive players. The offensive line will struggle to keep rookie quarterback Josh Rosen upright against the potent Vikings’ pass rush. Opportunities for tackles will be few and far between. There hasn’t been a defensive back with more than seven total tackles against Arizona this season.